This collection of three classic New Yorker designers encapsulate the fantasy aspect of fashion and also strangely tie into one another. 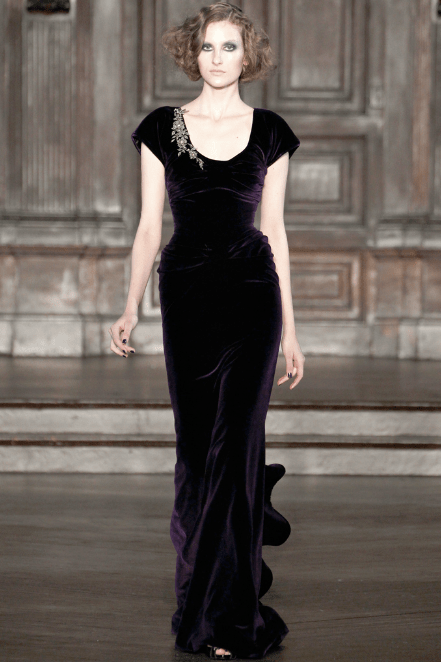 While Ralph Lauren continued to dominate the Great Gatsby trend, taking it a notch further by going back to the Edwardian era with bowler hats and Sherlock inspired tweed suits; L’Wren Scott channelled the inner forties with her drop waists, luxurious silks and dashings of coloured fur. 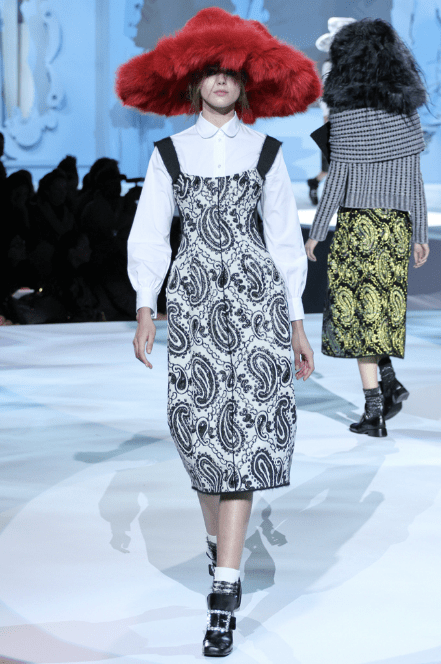 It was Marc Jacobs though who really took the crown for period fashion, harking back Marie Antionette and the Georgian period with full skirts and a dollop of punk. 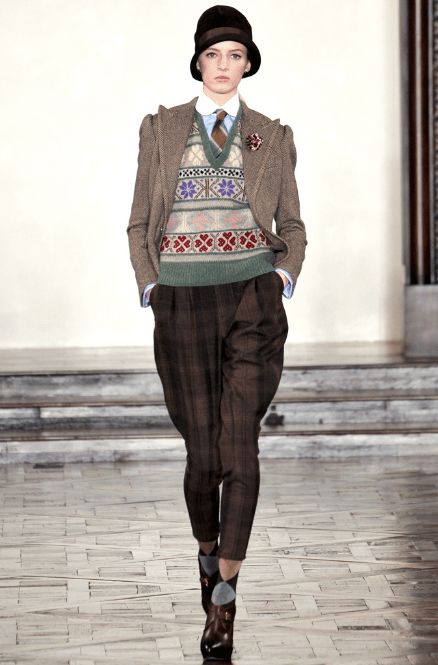 Continuing his inspiration for the Great Gatsby trend with aplomb, Ralph Lauren has focused more on the daytime wear of the country gentry with his tweed suits, hunting trousers and mismatched print knitwear. 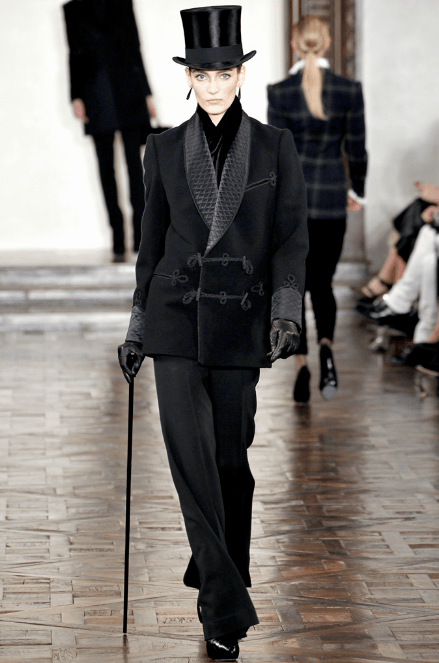 The feeling this time is more on the masculine aspect of dressing, with smart suits, evening and smoking jackets and elaborate headwear such as bowler and top hats. While last season focused on the feminine of the roaring twenties, this season he has turned his attention to the masculine, creating an old-world feel for the androgeny look. 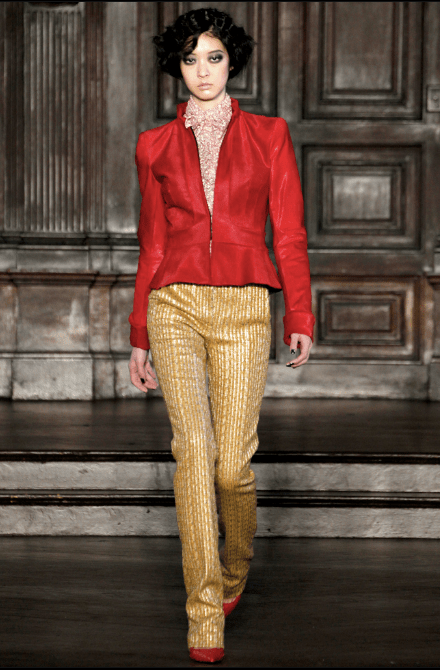 It is Lauren’s array of jackets and coats, from the classic smoking jacket, to the formal dinner jacket and even the morning coat makes and appearance in modern fabrics such as stiff leather, luxurious velvet, sequins and fur lapels. They epitomise the elegance and wealth of the era better than anything and I for one for them. His dresses might be smart and elegant, this season they are not the primary focus and for Ralph Lauren that is surprisingly refreshing. 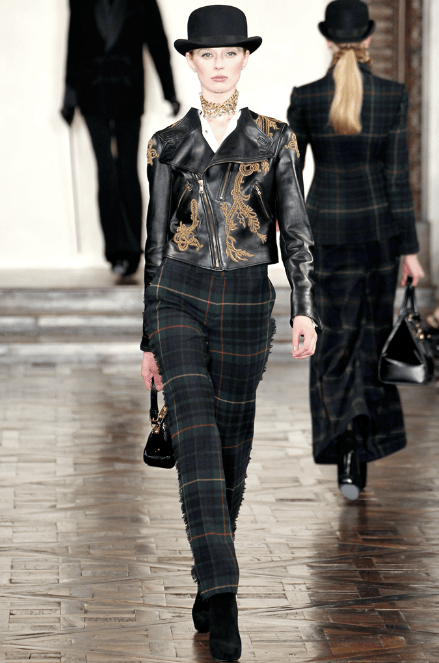 Anyone would suspect that we had another trend on our hands with Ralph Lauren and now L’Wren Scott, but that would be too simplistic. 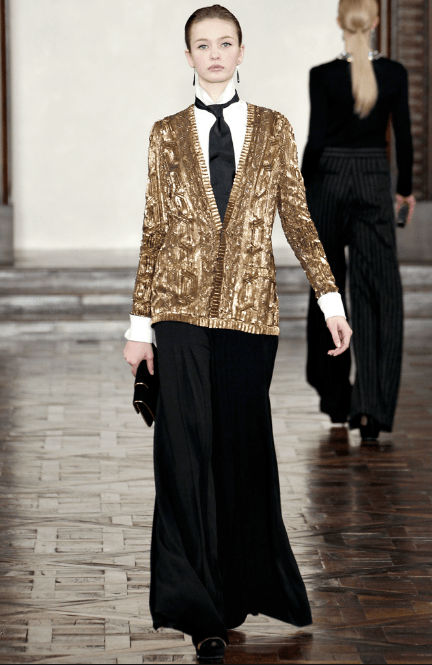 The reality is while Lauren might have looked to the roaring twenties while incorporating very Edwardian pieces, L’Wren Scott looked forwards, focusing on the forties with their austerity and blocks of colour. But austerity wasn’t the name of the game here. Her fabrics were rich and luxurious, expensive silks, coloured furs and rich velvet that oozed wealth and not the war-time rationing the era might have been more accustomed to. 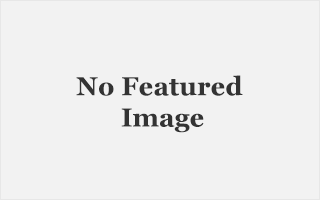 Her pencil skirts were beautifully cut, the dress hen length hovered just past the knee and her trousers were high waisted with a clean straight leg cut. Her colours too were richer than might be expected; rich reds, oranges and even splashings of bright yellow, making for a very warm autumnal palette. It is her capes without a doubt that are her piece de la resistance, for me. 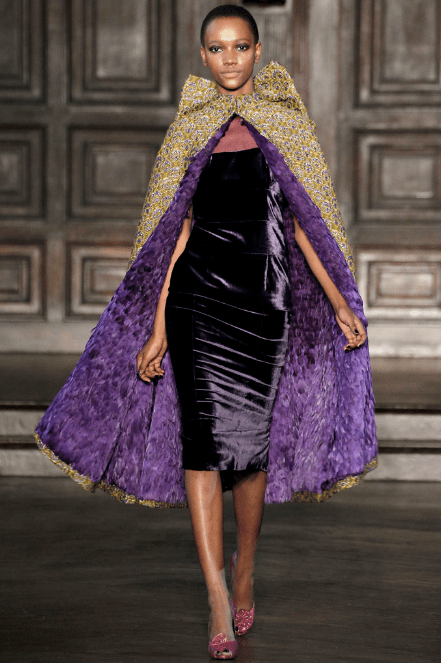 Heavy brocade on the outside and purple crushed feathers on the inside made the perfect luxurious example of excess. The Occupy Fashion protesters might not like her excess, but I love it. His ticket would always undoubtedly be the hottest in town for fashion week, and this year he did not disappoint. 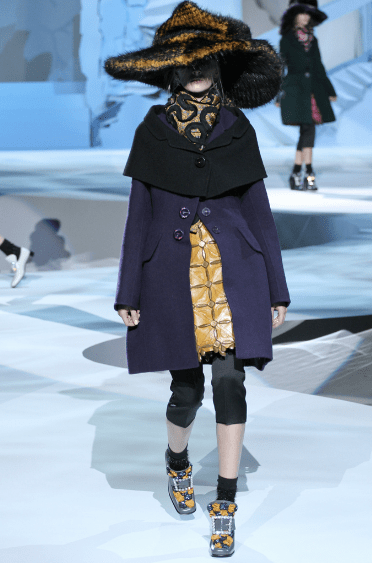 Ever the consummate showman, Marc Jacobs truly gave us his very own fantasy land. The set, designed by his artist friend, Rachel Feinstein has a ‘Marie Antionette in ruins’ feel, as Feinstein so eloquently explained and this was even more so obvious with the makeshift fountain in the middle of the catwalk that the models had to traverse around. The Georgian period had its influence in more subtle ways on Jacobs’ clothes; all that gave the theme away were oversized fur hats, padded hips on skirts and dresses to imitate the classic pannier hoop skirts of the Georgian period. This was all over-layed with a distinctive punk feel, with grungy hair, mismatched scarves and an attitude that spoke of laissez faire. His attention to detail also makes his stand out among the many others designers showing at Fashion Week, for his shoes are chunky elaborate, his bag comes in beautifully bold colours and his oversized scarves are perfect for the winter months. This might not be an easy to wear ready-to-wear collection, but buy God is it elaborate. So what did you think of these three? What were your favourite pieces from the collections? I love lWren Scott’s outfits so much!!!! There so floaty and magical, like your going back in time.